The Lantern procession takes place this year on Saturday September 15th and starts at 7.15pm. 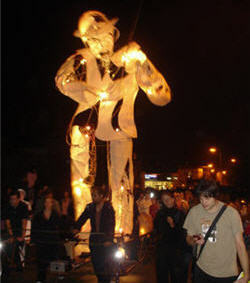 Arguably the best of the Ulverston festivals events is the Lantern Procession part of the Ulverston Charter Festival which involves Ulverstonians creating lanterns and parading them through the town in winding rivers of light. Each year there is a new theme and for 2012 it is ‘We’ve Built a Lantern Town’. Four separate parades converge on County Square from different areas of the town so that is the place to be! The annual event culminates in an exciting display of theatrical performance and fireworks in Ford Park.